Understanding Architecture 2 Edition This best-selling, illustrated survey of Western architecture is now fully revised throughout, explaining the structure, function, history, and meaning of architecture in a way that is both accessible and engaging. The long-awaited second edition includes: new coverage on Postmodernism and its relationship to the Modernist era; a reorganization of Mesopotamian and Prehistoric architecture based on thematic lines of development; an expanded chapter on Medieval architecture, including developments from the end of the Roman Empire to the Renaissance; and an expanded art program that includes over 500 images in black and white and color. Understanding Architecture continues to be the only text in the field to examine architecture as a cultural phenomenon as well as an artistic and technological achievement with its straightforward, two-part structure: (1) The Elements of Architecture and (2) The History and Meaning of Architecture. 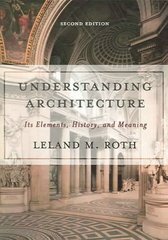 Comprehensive, clearly written, affordable, and accessible, Understanding Architecture is a classic survey of Western architecture.